WARNING: This article contains potential spoilers for Rogue One: A Star Wars Story. 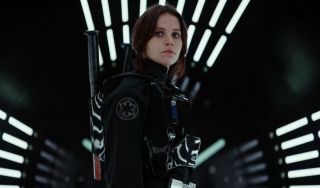 The level of secrecy surrounding Star Wars: The Force Awakens was very high, and it looked like Rogue One: A Star Wars Story was going to follow suit. Thankfully, JediBibliothek have uncovered a work-in-progress visual guide for the Star Wars spinoff which reveals a lot more info on the highly anticipated film. Felicity Jones plays Jyn Erso, a highly skilled soldier and warrior. ??? plays Pao , an alien who is described as a "fierce warrior". Looks like another computer generated character. Donnie Yen plays Chirrut, who is described as "a spiritual warrior". ???? plays Bistan, another CG-looking alien who is also described as "fierce warrior". Ben Mendelsohn plays Director Krennic, the military director of the Empire who is tasked with defending the Galactic Empire against the threat of the Rebels. Directed by Gareth Edwards and starring Felicity Jones, Diego Luna, Riz Ahmed, Ben Mendelsohn, Forest Whitaker, Mads Mikkelsen and Alan Tudyk, Rogue One: A Star Wars Story is scheduled to open in UK and US cinemas on December 16, 2016.